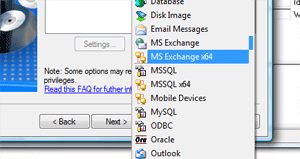 Version 6.9.6 comes with two new plug-ins for protecting 64-bit versions of MS Exchange and MS SQL Servers. Important: To use the plug-ins, install Handy Backup Workstation x64. Without it, the plug-ins will not display any data. Designed specifically for 64-bit systems, Handy Backup Workstation x64 allows the core application to back up and restore 64-bit applications. Local Backup. Users of Handy Backup Server Network who need to back up Exchange 2010 or MS SQL on a local system, need to simply install Handy Backup Workstation x64 on the same computer. Network Backup. If you want to back up Exchange or SQL Server located on a remote workstation, install the 64-bit Workstation on that computer, and perform common configuration of Backup Network Workstation. Make sure that Workstation name is different than the name of the original workstation (by default, the configuration utility will add the "_x64" postfix), or otherwise it will replace the original workstation in the Handy Backup Server Network’s backup network. 64-bit Workstations are licensed individually, i.e. the use of both 32-bit and 64-bit Workstations on one computer requires two “spots” in the backup network of Handy Backup Server Network. You can add more workstations to Handy Backup Server Network for $19 per unit. To do it, please contact us at sales@handybackup.net. Several users have reported that the MySQL Backup plug-in worked incorrectly when backing up databases or tables with names starting with digits. In version 6.9.6 this issue has been fixed. Minor optimizations were made to the FTP backup engine, user interface, and other parts of the program.